This book is such a valuable resource! 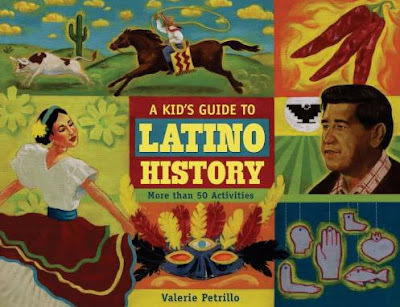 A Kid’s Guide to Latino History (aff) by Valerie Petrillo could almost be used as a lesson manual discussing the History of Latinos in the Americas, as well as for geography and cultural awareness. The book is fun and educational, but this one is better suited for older children ages 7 and up. However, many of the activities may be modified for younger children. The work itself is broken down into 10 categories, beginning with Columbus’ discovery of the New World and working its way through the contributions and history of the various Spanish-speaking countries in Latin America. Each chapter offers not only the history of a country or people, but also gives directions for creating a craft or recipe from that country. For example, in chapter four, Petrillo highlights Mexican Americans and offers instructions for playing various games such as Lotería, as well as how to make capirotada, cascarones, pan de muerto, and even farolitos. And this is just a sampling! Some of the other chapters focus on Puerto Ricans, Cubans, Dominicans, and Central and South Americans. This awesome book is more of a learning manual full of creative projects to capture your child’s interest and pride in their own heritage. One of the things seriously lacking in most (if not all) homeschooling curricula, is a good text describing our history and the important role that Latinos have played in the formation of the United States. The back of the book is also full of resources for parents and teachers. Included is a bibliography for children AND adults, a list of Latino museums, a section on Latino movies and videos, websites for kids, and finally, an awesome teacher’s guide, which breaks down the activities by grade level, ways to modify the activities, and suggests extended learning opportunities.